Bill Nye Couldn’t Be More Wrong! 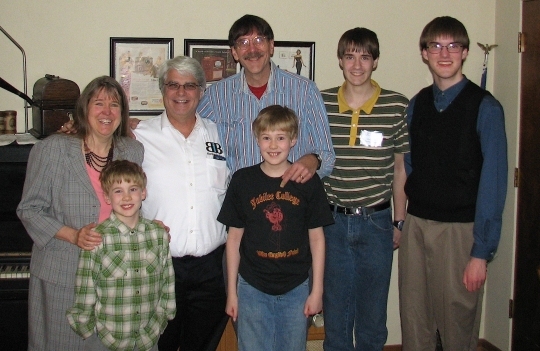 Me with a family whose eldest is about to finish an MD/PhD program. I have probably harped on Bill Nye’s errors far too much (see here, here, here, here, here, here, and here). Partly, this is because he continues to make them, when even a small amount of self-education would fix that problem. Partly, it is because some of his errors are so incredibly egregious. This post is a result of the latter situation. This is one of the most egregiously false things that Mr. Nye has claimed, and that’s saying a lot, given that it took me twelve pages to detail all of the errors I found in his book. I want to give you some idea of how egregiously wrong that statement is by just highlighting a few people I have met over the past six weeks. Let’s start with the family pictured with me at the top of this post. The woman in the picture is a homeschooling mother. She has two young ones with her, but she wanted to tell me about her eldest son, who is in the fifth year of his MD/PhD program. Why is he getting two advanced degrees? Because he wants to do cancer research. To treat patients, you typically need an MD. Being trained to do original research typically involves getting a PhD. Thus, those who want to do original research in medicine often get both an MD and a PhD so they have all of the relevant training they need. This mother’s son demonstrates in no uncertain terms how wrong Bill Nye is. 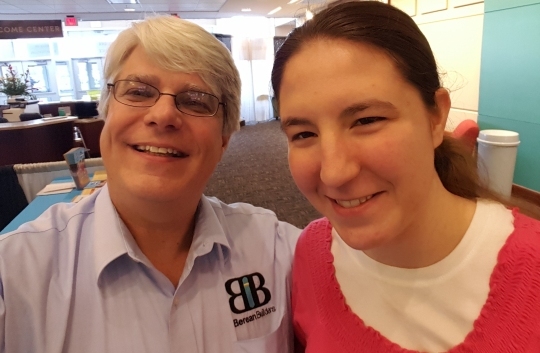 I met her in Peoria, Illinois this past Friday, when I spoke at the APACHE homeschool convention. She came up to me at my publisher’s booth and told me that her son had asked her to inform me of two things: First, my science courses encouraged him to pursue medical research as a career. Second, they helped him excel at university so he could get accepted into medical school. I am not telling you this to “toot my own horn,” even though a former pastor of mine says I play that particular instrument very well. * I am telling you this because my courses are young-earth creationist courses, and this mother gave her son a young-earth creationist education. Far from suppressing “the basic human curiosity that leads to asking questions,” this young man’s creationist education encouraged him to continue to ask questions, explore the world around him, and make discoveries. He has, most certainly, already felt “the joy of discovery that science brings.” Indeed, I suspect he will be experiencing that joy for the rest of his career. Now, if this justifiably-proud mother were the only person I met recently who demonstrated Mr. Nye to be wrong, I probably wouldn’t have posted about her and her son. However, the Lord has led several such people to me recently, and I want to introduce a few of them to you! 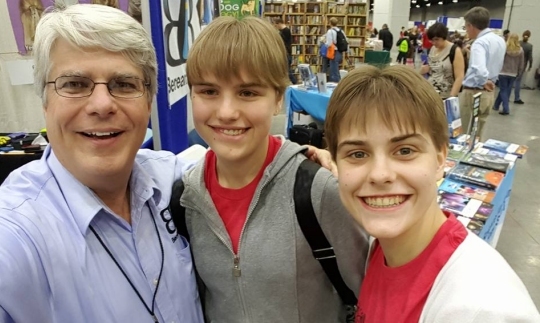 She and her sister came up to me at my publisher’s booth when I was speaking at the Great Homeschool Convention in Cincinnati, Ohio. At the ripe old age of 18, she has already earned her college degree in natural science. She plans to pursue an advanced degree so she can do scientific research. Can Mr. Nye tell me how she going to “miss out on countless exciting adventures” when she has such a head start at studying the natural world? Please note that her sister is following in her footsteps, already working on a college degree of her own at the ripe old age of 17. 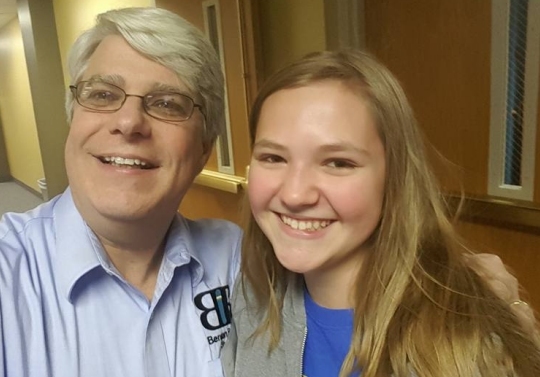 Next, meet a high school student who literally ran up to me while I was at the Greater St. Louis Home Educators Expo and told me that physics is AWESOME. 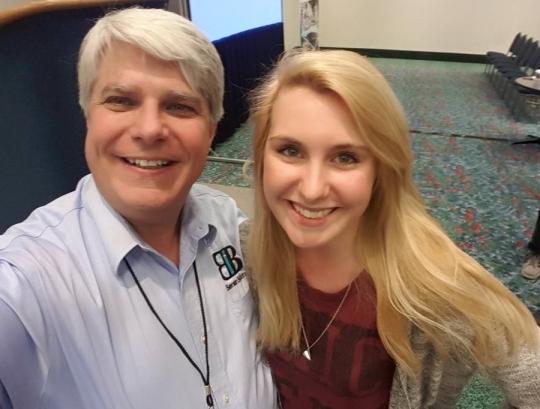 At the beginning of the school year, she had no idea that she would enjoy physics so much, but the more she studied my young-earth creationist physics course, the more she loved it. She said that she was just amazed at how God put the physical laws together so that everything worked so well. She doesn’t know exactly what she wants to study in college yet, but she figures it will be physics-related. Speaking of physics, this person demonstrates how creationism and homeschooling can often work hand-in-hand to produce people who want to study science. She was another person I met at the APACHE homeschool convention. She is an engineer who currently works for CAT and is pursuing a master’s degree in mechanical engineering. Mr. Nye has a BS in mechanical engineering, so this woman already has more formal education than he does in his chosen field of study. Interestingly enough, when she was in high school, she had no desire to study physics, which is (of course) the basis of her field. However, her brother wanted to study it, and she agreed to study it with him, just to help him pursue his interest. After helping him work through my physics course, she was hooked! As I said, this shows how a young-earth creationist education, combined with homeschooling, can inspire a student to go into a science-related field. Had she not been homeschooled, she would never have taken physics. However, because she was willing to be a helpful homeschooling sister, a life-long interest was sparked. 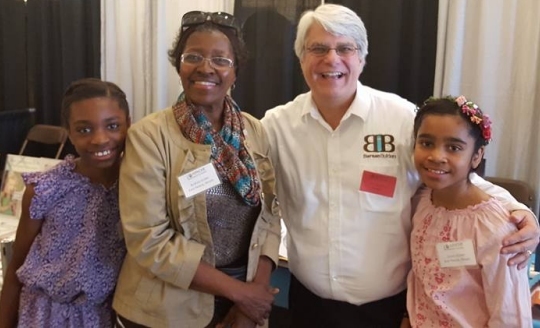 My publisher and I had the pleasure of spending an evening with this family while we were at the APACHE homeschool convention. All of their sons use my young-earth science curriculum. The eldest is currently studying psychology in college. The next younger son is a computer whiz. The two youngest boys are currently studying my elementary science series, and they excitedly showed me their journals, told me about their favorite experiments, and gushed on and on about how much they love science. Whether or not they end up going into a science-related field in the future, it is clear that even at this age, their curiosity about the natural world is far from suppressed! Instead of keeping students from feeling “the joy of discovery that science brings,” then, a young-earth creationist education can inspire students to love science and want to learn more about the natural world. In many cases, it also makes them better college science students! So when the Lord starts usin’ you don’t you pay it any mind. He could have used the dog next door if He’d been so inclined. I love this post too! Neither of mine have any interest in science at all (they take after their mother, I guess) but I honestly learned it through (Apologia–old editions!) when they took the courses. In my public high school, I took biology from an self-proclaimed atheist who said we’d be learning about evolution through SCIENCE, and if SOME PEOPLE wanted to believe that GOD (said sarcastically) created the world in SEVEN DAYS, then they could remain ignorant. Thus, I filtered everything he said through my false-o-meter and believed science and Christianity were incompatible. How does Bill Nye explain that, I wonder? Secular humanism squelched any natural desire I had to learn anything science-y. An elementary school teacher that was really into science mocked my faith in front of the entire class and turned me off of science. I studied just enough to graduate from high school. I refused to take the college prep sciences such as Biology and Chemistry because I wasn’t interested in science. Now, as a homeschooling mom, I’m discovering a passion for learning about creation that I never had in public school. My 10 year old is considering a career in science and my 17 year old loves learning about the human body. Dr. Wile, I am all grown-up, and a homeschooling mom. We use your elementary series for our younger crowd, and your jr. high/high school courses for our older kids. I teach General Science in our local co-op, which is dedicated to science; particularly your books. I went to public school while growing up, and always hated science. I didn’t understand how to reconcile the Bible with science, so I tuned it out. When we started using Apologia, the light bulb turned on for me, and I have developed a love of science as an adult that I could have never imagined! I sometimes wonder if I would have chosen a different path of study in college if science could have been presented to me from the Creationist/Young Earth view. (I majored in Theatre/English) But…better late than never. Has he done stats? No!. It is a off broadway common charge that creationists resist science but its really just because we resist A FEW conclusions in certain subjects made by small numbers of people. In short we disagree with people and not science. We disagree with bad science in other words. or erroneous. I welcome Nye because he not only brings attention to origin issues to audiences that then can be approached by creationists for rebuttal but I don’t welcome him embarrassing his own side. I don’t think it helps. by the way in canada whenever I knew about homeschoolers, All evangelical, they tended to be from the smarter families or rather the upper/upper middle class types. To teach your kids and be confident they got taught takes confidence of the parents. Your pool of acquaintances was unavoidably small. Sometimes confidence is squelched by being told that only upper middle-class parents can do this or that. This sort of mind-bending can also be targeted at black or minority ethnic groups. In reality, BME and working class children can do just as well,*if they are not held back by low expectations*. Since home educating is cheaper than private school,it is an accessible and positive choice for all sorts of families. I have seen this. In Canada I suspect it is the upper class etc. Or at least the smarter class types. Indeed not my circles generally. I don’t like the term ethnic minority as its not accurate. what you mean is foreign immigrants who have not assimilated into americans including Africans. I think they can homeschool of coarse, especially with good info, but its surely demanding teacher competence. Teachers surely do have skills and there are better/worse teachers. its not as easy to teach as driving a car surely. I doibt my mom or dad could do it or me. There is skill. Thats why homeschooling has serious teaching techniques behind like from the host of this blog here. Dr Wiley might just do a better job of instructing homeschoolers. others might not. 1. It is neither the “upper class” nor the “smarter class types” who are predominantly homeschooling in the U.S. or Canada. One Canadian study, for example, found that nearly twice the percentage of publicly-schooled children come from families with incomes of more than $60,000 per year as compared to homeschooled children. In addition, homeschooled children were more likely to have parents with no college degree than publicly-schooled children, and they were less likely to have parents with an advanced degree. Thus, the average income and education level of homeschooling parents in Canada is lower than the average income and education level of parents who send their children to public school. Despite this fact, they provide (on average) a better education than the public schools (see point 4 below). 4) Most homeschooling parents produce better students than the public or private schools (see here, here, here, here, here, here, and here). Once again, this shows that teacher training has little bearing on homeschooling. 5) My name is Wile, not Wiley. I’m coming from a observation in evangelical circles on homeschooling. In fact critics accuse homeschoolers as religious people avoiding a left wing education system. They accuse here. I question the interpretation of the stats here. i suggest homeschooling is done by smarter/upper types RELATIVE to evangelical circles. I don’t see why the public schooling stats are relevant. I don’t mean homeschooling is done by regular people of the upper class. or income wise etc. I mean relative to the demographics who homeschool its the smarter/upper types. Hmmm. We are dealing with averages here. i think the true stat would be to compare homeschoolers relative to those who MIGHT homeschool. In fact I’m really referring to evangelicals who homeschool. I would say its the uppers in this group. Of coarse I welcome all demographics and like the homeschooling movement. I don’t agree at all with your ethnic minority position. By defination that would make every single identity in america a ethnic group. What group passes 20%?? Nationally in america is american. How could there be other nations living as citizens in America but are not American. In reality its American identity and identities that have refused to assimilate into that . So its american and foreign CITIZENS of America. So its a error and even illegal to accept the concept of minorities. Possibly one true minority would be the Southern minority as they were here before the American revolution. As to parents teaching as well as teachers (the mean) I would again think it unlikely except with smarter then average parents. I do think teaching is a skill . Hmmm. You say they used facilitate. Well then the kids don’t need teachers and indeed should do better then kids, like everyone in my circles, who do. Anyways homeschooling is a great thing and is attacked by the left wing because they can’t impose liberal moral beliefs. 1) You now say that you meant to claim that homeschooling is done by smarter/upper types relative to evangelical circles. Once again, however, that is false. Studies show that in terms of both education and income, evangelicals are very close to the average of the general population. Thus, homeschooling is done, on average, by evangelicals of lower income and education than the total population of evangelicals. 2) The public schooling stats are relevant because the vast majority of people send their children to public school. Thus, when you start making statements about who homeschools, you need to compare them to the rest of the population, which is well represented by the public schools. Homeschoolers, on average, have lower education and income than the total population as well as the total population of evangelicals. Nevertheless, they produce students who are measurably superior in academic terms. As a result, you can easily conclude that income and education level do not correlate to homeschooling success. There are, of course, studies that confirm this. 3) You might not agree with my ethnic minority position, but that doesn’t change the definition of the term. As I told you before, the definition of ethnic minority is “a ​group of ​people of a ​particular ​race or ​nationality ​living in a ​country or ​area where most ​people are from a different ​race or ​nationality.” Of course, this doesn’t make every single identity group an ethnic minority. It simply makes those ethnic groups that are not part of the majority ethnic minority groups (which ought to be painfully obvious). If, for example, you are a caucasian living in China (even if you are a born citizen of China), you are part of an ethnic minority. If you are Chinese and living in China, you are not an ethnic minority. Once again, assimilation has nothing to do with it, and neither does citizenship. You can’t change the definitions of words just because you don’t like them! 4) Teaching is a skill, but once again, it is not relevant to homeschooling. This is why homeschooled students whose parents are certified teachers perform roughly the same as those whose parents are not certified teachers. Thus, just because Hope and Anthea have done great jobs homeschooling, that doesn’t tell you anything about how they would perform as school teachers. Homeschooling parents do not use the skills that school teachers do. Well I welcome homeschooling doing better then public and so on. Of coartse education/income level does not equal intelligence except there must be a favourable curve. In my experience it was the sharper people who had the confidence to teach thier kids in evangelical circles. The stats can be funny in how one looks at it. I do think just homeschooling alone shows a very assertive parent. I still disagree that ethnic equals colour. So all identities in America would be minorities or ethnic groups if one allowed ANY. White is not a ethnicity but polish in Norway would be. Terms do matter and i see Americans as a real people and those unassimilated as foreigners who are just citizens of America. They admit to this by hyphening thier identity. Americans do not. Anyways I love homeschooling and do think competent parents can teach/help learn thier kids. I do think teachers, good ones, will do a better job them these parents in the grade levels above grade six etc. Anyways I noticed in my life I could catch up and do as well in a week what I misseds in four weeks when in high school and getting eye operations . I do think self learning more likely helps kids, or many, rather then class learning. It forces one to be more attentive and maybe seeing reward in results quicker encourges. Just speculating on why homeschooling is so beneficial. It was a interesting thread on your blog. I learned things too and will all the more encourage folks to consider , not be afraid, of homeschooling. 1) In my experience, homeschooling does not show an assertive parent. 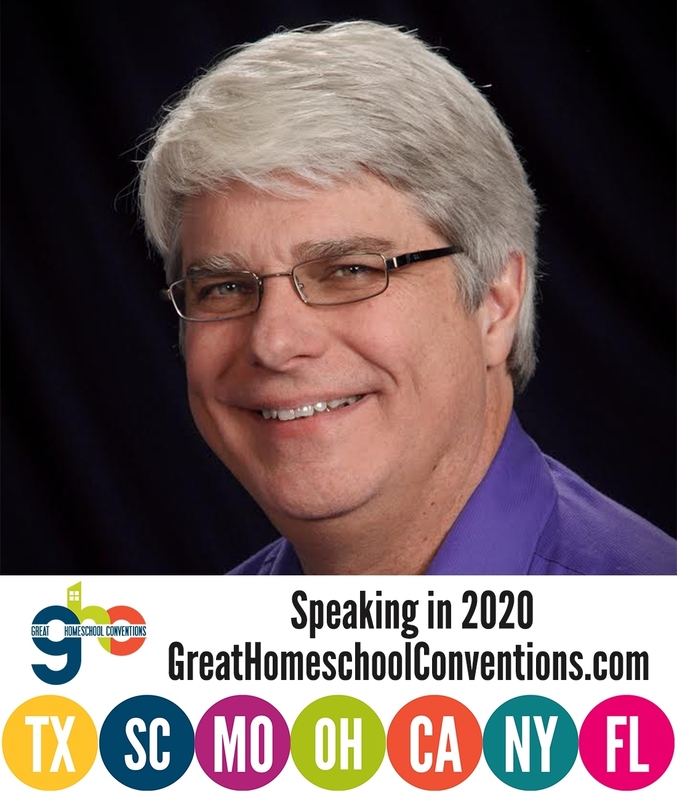 I have experienced all sorts of homeschooling parents since I have been working in the homeschooling community for more than 20 years. I don’t see any abundance of assertive parents. In fact, I see mostly humble parents who are simply trying to do what they think is best for their children. The most assertive parents I know are those who send their children to private schools. 2) If you actually thought that terms matter, you wouldn’t argue against the term “ethnic minority,” since that term is well-defined and well-understood. As I told you before, this term does not include all identities. It only includes racial identities and national identities that are not in the majority. Thus, women are not ethnic minorities, as they are neither a race nor a nationality. Evangelical Christians are not ethnic minorities, as they are neither a race nor a nationality. Caucasians are not ethnic minorities in the U.S., because that race is in the majority in the U.S. However, African Americans are ethnic minorities in the U.S., because they are a race that is not in the majority. Once again, assimilation has no bearing on the matter. It is odd that you keep bringing that up, as it is nowhere in the definition. 3) You may think that teachers will do a better job than homeschooling parents in higher grades, but once again, you are dead wrong. As I showed you previously, homeschooling parents produce better students at all grade levels. Indeed, one of the studies I linked previously (the Rudner study) actually shows that homeschooled students are more academically superior to publicly-schooled students the older they get. It also shows that those students who are homeschooled for a while and then go back to school do not achieve as much as those who stay in homeschool. The highest disparities between the achievements of homeschooled students and publicly-schooled students occur in high school. Thus, homeschooling parents do much better than teachers for the higher grades. This is born out by the many, many studies that show homeschoolers outperform both privately-schooled and publicly-schooled students in univerisity (once again, spend time actually looking at the studies I linked previously). Robert, with all due respect, I don’t find that it is the “upper class” who are homeschooling in the US. I have been a home educator for the past 15 years. We have lived under the national median income in the US for nearly all of our 28 years of marriage. I have an Associates Degree and my husband a high school diploma. We have had a meager budget on which to purchase curriculum. Yet, my sons have consistently scored well over the median national scores on standardized tests. Every one of my sons scores in the 88th – 97th national percentile on the science section. My oldest son has won multiple scholarships, he has been inducted into two honor societies in college, and has thrived at higher education. And, yes, we taught using Dr. Wile’s science curriculum. It has proven, for me, to be rather easier to teach than to drive. Mea culpa. Teachers don’t have blue capes or superpowers, just a set of specific learned techniques to use in a group setting. Its not easier to drive then teach. 16 year olds drive but never should they teach. its not just a set of instructions. You might be sharper then you realize. Just wanting homeschooling is a clue to your thoughtfulness on education. you are a thinker. In fact maybe you could be a better teacher for public schools!? I don’t think the upper class homescholl either. However its my observation its the upper middle/upper/smarter class who will homescholl relative to those who homeschool. In Canada i meet it amongst evangelical people. Amongst these it seems its the sharper evangelicals. its a big deal to have confidence to take kids out of the school system. Teaching/assisting them is not that easy. HEY . don’t sell yourself short. The mere fact you wanted homeschooling shows a sharp attitude about schooling. Your income levels in your case don’t accurately define your smartness. Your kids easily could just be like you. In public schools they might also have got the great marks. intelligence is about motivation as the bible teaches. Ah, Robert, you are very gallant. I will accept your kind words, since a lady always loves compliments! If you poke around on this site, you will find interesting accounts of Dr Jay’s trips to conferences, where he meets all kinds of pupils. It is most encouraging — well, I find it so. Dr Jay is also on Facebook, where he has recently started posting selfies with youngstes who learned their science at his knee, as it were. “youngsters”. It is 11 pm here in the UK. That’s my excuse and I’m sticking to it. As a secularly trained scientist (BS in biology, MS in immunology with a minor in biotechnology), I truly thought that creationists were… well… nuts. But I came to Christ in my mid 30’s and He completely turned me around. At the time, I was bored with science – it had become rote, lacking anything that really motivated me to jump into new ideas. Now as a homeschool mother, I have become completely enamored with science again – using Apologia books! Suddenly science is interesting again – suddenly it has an amazing place in a wonderful creative story! From my own experience, I’d say that non-creationist science almost killed my love of science. Creationist science, on the other hand, has opened up whole new ways to think and process what I know from my earlier history! And as far as joy – before my relationship with Christ, I never experienced the joy of discovery in science that I have now. Dr. Wile, one of the things I really appreciate about your science books is the biographical sketches of the lives of key scientists such as Newton. Thanks for pointing out how their faith in our Creator was their motivating impulse. I hope that these wonderful youth that you are teaching and we are raising will grow up to follow in that path of faithful discovery. Bill Nye clearly doesn’t understand what actually causes progress. The idea that the entire populace must all believe a certain way in order to advance as a society is a popular view, but is completely arrogant and misleading. Real progress results when individuals have a willingness to think for themselves, not assume that everything they were told was true, seek out problems, and find solutions to those problems, not when every living being on earth accommodates “Bill Nye the science guy’s” account on the origin of the universe. It’s time to stop using emotionally-invoked arguments for why different opinions are dangerous to societal development. Such manipulative rhetoric is irrelevant to how progress is truly derived and leaves the manipulator looking utterly foolish. Your article exposes this fallacious nonsense for what it is. Thanks! No, Scientists Did Not “Partially Revive” Pig Brains! Best Evidence Yet for a Black Hole! Soft Dinosaur Tissue Looks Really Young! A Cure For Cancer? Probably Not! What a Way to Bring in the New Year! Is This Object from an Alien Spacecraft? Does Anybody Really Know How Hot It Is? Are All Animals Really Omnivores? Another Newly-Discovered Feature of the Human Body! Pre-Kindergarten Education Might Cause Long-Term Disadvantages! Mathematics Leads Biologists to Discover a New Cell Shape! No, We Won’t Have Dinosaurs in Two Years! Print Reading versus Digital Reading: Which Produces Better Comprehension? Will Scientists Resurrect the Woolly Mammoth? Study Demonstrates that Most Animal Species Came Into Existence at the Same Time? Do “Climate Change” Skeptics Behave in a More “Sustainable” Way? DNA Is Even More Complex Than We Thought! It is Now a Risk to Promote Free Speech in Science! Once Again, Don’t Believe Facebook When It Comes to Science! This Galaxy Has No “Need” For Dark Matter! A New Feature in the Human Body Has Been Discovered! NASA’s Study Indicates Space Changes GENE EXPRESSION, not GENES! My New Elementary Science Series and My New Chemistry Course Win Awards! Where Did Western Philosophy Begin? Birds Seem to Intentionally Spread Fires! Lightning: A Natural Nuclear Reactor! Please Stop Believing Facebook, Especially When It Comes to Science! What’s the Matter with the Universe? Sometimes, It’s the “Deniers” Who Are Right! Trigonometry from The 18th Century BC! When People Don’t Believe in God, They Will Believe Anything! When Richard Dawkins Notices Your Inconsistency, You Have a Problem! Can Courses Taken in Junior High Be Included on a High School Transcript? Scientist Isolates Individual Dinosaur Cells! Can a Homeschooled Child Take an Extra Year of High School? I Will Be Teaching Online Classes! Microfossils? Maybe. Oldest? Who knows? What Happens to the Mind When the Body Can’t Communicate? Lichen Kept This Secret from Scientists for Almost 150 Years! Confirmation of Feathers On A Dinosaur? The Reviews (At Least Some of Them) Are In! Does science undermine human rights? No, But Materialism Might. Another Earth-Like Planet? Not Really. Coral Bleaching: A Death Sentence or An Adaptive Mechanism? Watch Your Assumptions: They Can Lead To False Conclusions! Flowers Use Electricity to Communicate With Bees! No, Dr. Michio Kaku Hasn’t Proven God’s Existence! What Drives Young People to Atheism? People Can Compensate for Bad Genes! Trees Exchange Nutrients Through an Underground Network! Yes, Earth Is Unique, But This Study Doesn’t Demonstrate That! Honeybees Are Recovering in the U.S.
What are the differences between my old chemistry course and my new chemistry course? Is There An Undiscovered Planet in Our Solar System? Using Pigeons to Diagnose Cancer? C.S. Lewis Wasn’t an Anti-Evolutionist, but He Did Work for British Intelligence! Put Away the Laptop. Take Longhand Notes. Did We Really Save the Ozone Layer? What’s Killing Corals? It Could Be Your Sunscreen. Do Selfies Result in More Deaths than Shark Attacks? Homo naledi: Human Relative? Probably Not. Who’s the King of The African Savanna? The Lowly Termite! Is Soft Tissue Common in Dinosaur Bones? Earth 2.0? We Have No Idea! What is the Relationship between Christianity and Science? Ask These Two Scientists. More Examples of Organisms Changing the Products of Their Genes! Homeschooling Promotes Intolerance? Think Again! Homeschoolers: Here’s Your Chance to Experience Living History! Hello, my name is Jay Wile, and I am a pyromaniac. What Does It Mean To Be Open-Minded? How Should a Christian Deal with Tragedy? What Keeps a Young Adult Active in the Faith? A Historian Asks: Is it okay to lie about history for a good cause? When it Comes to Temperature, You Might Not Be Able to Trust the Data! How Do You Design the Best Train? Copy the Designs of the Ultimate Engineer. Even Leaf Fossils Contain Original Remains After Sitting for Supposedly 50 Million Years! The More We Learn About Bone, The More Amazing It Is! Fascinating: Your Brain Gets Heavier When You Think! Can Fear Be Inherited? This Study Seems to Say “Yes,” at Least in Mice. Will This Bring Back the Moon Dust Argument? Watch The Ham/Nye Debate FREE At Home! Babies Learn Music and Language in the Womb! The Benefits of Musical Instrument Lessons Last A LONG Time! DNA Is Even More Sophisticated Than We Thought! Chromosome Fusion? It’s Getting Harder and Harder to Believe. The Bacterial Flagellum: More Sophisticated Than We Thought! Why Do We Have to Sleep? Astounding: Your Baby Can Heal You! Those Who Say Religion Is Important Are More Likely to Lie? Is it “hilarious” or “an exclamation mark” on an “already-clear conclusion”? Relationships in Nature Go Deep – Really Deep! People Weren’t The First to Develop an Internet! The Inquisition Strikes Again – Twice! Want to Lose Weight? Ask Your Bacteria for Help. Can Random Processes Produce Biological Information? “Ancient” Bacteria Use Quantum Mechanics! Will Scientists Be Able to Clone Mammoths? Exactly How “Green” are Wind Turbines? Are We Becoming Less Intelligent? Does Natural Selection Weed Out Harmful Mutations? The Appendix Is Now So Important That It Supposedly Evolved Many Different Times! Nature’s Farmers Are Pretty Smart! Being Degenerate Can Be Very Good! Poop Transplants Treat Clostridium difficile Infections! Male DNA in Female Brains? Yes! Bacteria in Breast Milk? Yes! What Is Christmas All About? Paleontologists Found What They Were Looking for….NOT! Is A Knee Replacement on That Playlist? Has NASA Finally Found Life on Mars? What Do Spiders Do With All Those Eyes? Same Chemical, Different Chemical Formula? Did Butterflies Evolve from Sea Snails? Remains of Cells: In DINOSAUR Bones! Remember That Nuclear Disaster in Japan? Time to Redefine the Concept of a Gene? Back To School? Add Doubt to Your Curriculum. It’s Amazing What RNA Can Do! Move Over, Kindle. This Scientist Stored His Book on DNA! One Gene = One Protein? Not Even Close! Another Example of Three-Way Mutualism. Is This Just the Tip of the Iceberg? Human Body Hair is Useless, Right? WRONG! You Cannot Promote Truth With Lies! Cells Might Actually Communicate with Each Other Using LIGHT! No, It’s Not a Tail! How Meaningful are Genome Comparsons? Jesus Talks to Pilate After the Resurrection? Just How Evil Is This “Evil Twin”? Octopuses Can Change the Products of Their Genes When Necessary! Could This Be a Clue About the Origin of Pathogens? Arched Necks In Dinosaur Fossils: Is Water to Blame? Is This a Miracle Tree? Not Really – It’s Just the Result of Amazing Design! You Never Know What They Will Discover…If You Let Them! Motherhood Has a Lasting, Cellular Impact! Certainty and Science Do Not Go Together! Life Isn’t All That Special? Hummingbirds Can Shake Their Heads at 34g! Making Something 100% Efficient Is No Problem For God! This Is One Smart Spider! Despite Their Protests, Evolutionist Do Depend on “Junk DNA,” and LOTS of It! Particles Traveling Faster Than The Speed of Light? Why Do Muscles Hurt One or Two Days After Weightlifting? Christian Educators – Heed This Survey! God’s Cleanup Crew Is Tougher Than Expected! Does This Really Blow a Gaping Hole in Global Warming? Is Anti-Boring Equal to Exciting? We Might One Day Know! Dr. Karl Giberson Does Not Want You To Think For Yourself! What Do Evolutionists Do When One of Their Own Is Honest about the Data? Yet Another Example of “Old” Fossils that Look Young! Birds Use Quantum Mechanics to Navigate? An Opportunity for Critical Thinking! More Good News for the Gulf! Let’s Break Off This Engagement! Who Cares About The Data? Don’t Question the Dogma! Oh No! He’s Wrong Again! Should I Feel Stupid FOR Running or Just AFTER Running? What Makes Bone So Strong? Bacteria That Cause Tooth Decay….Good for you? Why Are Asexual Animals Rare? Debate: Do Vaccines Cause Autism? What Did NASA Really Discover? And I Thought Slime Couldn’t Get Any Better! Thank God for Whale Poop! Are Autism Rates Really Rising? How Do Bacteria Smell? Very Well! Why Sacrifice? After All, She’s Just Our Daughter! With Enough Blind Faith, You Can Believe Anything! The Chicken Did Come First, But Not For This Reason! More “Junk” That is Really Gold! Imagine That – The Sun Is Important! Blood Platelets…Not Just for Clotting! Coyne and Embryonic Development…Wrong AGAIN! Is DNA Providing a Coherent View of Evolution? A Million Visitors in Just Under Three Years – Amazing! With Enough Faith You Can Believe Anything! 99%? 95%? 87%? 70%? How Similar is the Human Genome to the Chimpanzee Genome? It’s Hard to Improve on What God Made! What Can a Dead Fish Tell You About the Nature of Science? Should Intelligent Design Be Taught in School? Science Fiction Convention – WOOT! Lobsters Aren’t So Stupid After All! Was There Animal Death Before the Fall? He’s a What? He’s a What? P.Z. Myers Blows a Gasket – What Fun! What Does a Chemist Do with Excess Sodium? Did God Create Earth with an Appearance of Age? Okay…So Most Likely, Birds Didn’t Evolve From Dinosaurs. What is an Evangelical, Anyway? My elementary science series and my chemistry course were voted #1 by the readers of Practical Homeschooling magazine. This is the second year in a row for my chemistry course, and the third year in a row for my elementary series. You can learn more about the courses by clicking on the blue ribbon. Proslogion Copyright © 2009 - 2019 All Rights Reserved.